Clusters of Megalithic Cairns are dotted around the Slieve na Caillaigh hills at Loughcrew, the main concentrations are on Carnbane East where Cairn T is the centrepiece and Carnbane West where Cairn L is located. The illumination of the passage and chamber at the Winter solstice sunrise in Newgrange is world famous. 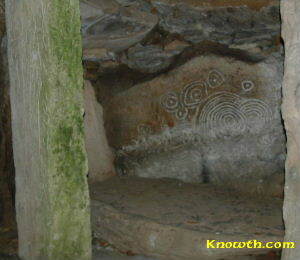 Less well known is the Equinox illumination at sunrise in Cairn T at Loughcrew. The backstone of the chamber is illuminated by a beam of light at sunrise on the Spring and Autumnal Equinoxes. The sun light is shaped by the stones of the entrance and passage and descends the backstone while moving from left to the right illuminating the solar symbols. Visitors are welcome to walk up Carnbane East to Cairn T, a ten minute walk up a grassy hill from a small car park. 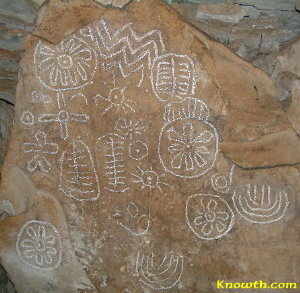 During the summer months there is a guide at Cairn T, at other times Cairn T is locked, so to get inside collect the key at the nearby Loughcrew Gardens. Equinox Stone - Loughcrew Cairn T Cairn T or Hag's Cairn is of similar design to Newgrange. Traditionally described as a Passage Tomb, the wonderfully decorated backstone shows that the Cairn has a clear astronomical purpose. A beam of light from the rising sun around the time of the March and September equinoxes is mapped on the backstone of the Cairn. The event lasts for 50 minutes and was captured on video on the morning of March 23rd 2005, view a time lapse version of the Equinox Video (compressed form 50 minutes to 1:46). A freestanding limestone monolith or menhir is positioned inside the chamber (on the left of the image). Martin Brennan discovered that the six foot high monolith is a marker for the cross-quarter days Samhain (early November) and Imbolc (early February), when the sun illuminates the stone. Map and directions to Loughcrew. Loughcrew Equinox Reflection by Sally McKenna. Reflections on Loughcrew and Newgrange by Tim O'Brien. Artwork by Helen Gavigan, inspired by the cairns and engravings at Loughcrew. A taste of the unexpected: subverting mentalités through the motifs and settings of Irish passage tombs. Loughcrew Cairns as described in Vale of the Boyne and Royal Meath published in 1898 for the Great Northern Railway Company. 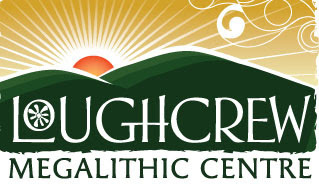 The Sacred Island website has a comprehensive section on Loughcrew. Equinox Sunrise at Cairn T from Geniet by Victor Reijs. Loughcrew Megalithic Centre - Family Run Megalithic Centre with coffee shop and original thatched house located near the car park for stone age Cairns at Loughcrew. Hostel accommodation, camping facilities and heritage tours of Loughcrew Cairns available.